Today’s guest post is by Shaun Rosado of Shauncastic! The sound of thunder, a crack of lightning and in a flash everything is different. No, I’m not talking about Flashpoint; DC Comics’ current take on a “Flash-centric” Event. I’m talking about the Flash as a character and the profound difference he’s made in comics. Ever since I was a child, I always felt a deep connection to the Flash. Perhaps it was the sense of the character’s long history, reaching all the way back to World War 2 with Jay Garrick as the original Flash. Perhaps it was the idea that when I was at my most impressionable the Flash TV show had just begun and would capture my imagination. Or perhaps it’s because the Flash is the most important character of the DC Universe. Yeah. You read that right. I typed it. The Flash is the THE most important character of the DC Universe. Of course, I don’t expect to get away with saying something like this without a little backup. So let’s take a moment and just go over the finer points of my argument. 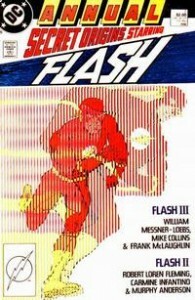 When the Flash began way back in the 40s, he was a character that was given his own book nearly as soon as he was established. 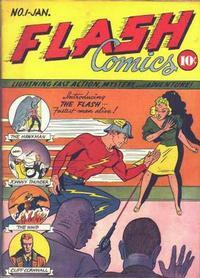 In January 1940, Flash Comics began as a variety comic that would feature new characters and give them a chance to flourish. Some of the most famous of these characters would be Johnny Thunder, Hawkman, Hawkgirl and Black Canary. This began an eerie precedence of the Flash establishing ideas and characters that would last and break out of his book time and time again. The book ran nearly the entire span of the Golden age, ending just a few months shy of the “official” end date. But this is not a sprint and the above argument certainly does not win the Flash the title of Greatest Character Ever. This is a marathon…and as we all know, the Flash is the Fastest Man Alive. I’m not making a convincing case so far, am I? Well worry not, we’ve just begun. 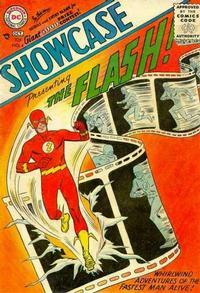 The Silver Age “officially” began with the publication of Showcase #4 in October 1956. Who did it feature? The Flash! Well isn’t that a coincidence? The Flash kicked off the era of comics that would establish the archetypical characters that still have a stranglehold on their titles today. These giants can all trace their beginning back to the first issue of the Silver Age and see our guy “The Flash” literally bursting out of the page ushering in a new era. During this time, we were also treated to one of the best stories ever told in the history of comics: Flash #123 – The Flash of Two Worlds. Prior to this book, DC comics were kind of like the wild west of comic publications. Everything “sorta” existed in continuity…when it was needed. But otherwise writers and their respective characters worked with impunity in their own corner of the DC universe and did whatever they liked because it usually had no effect on the rest of the world. 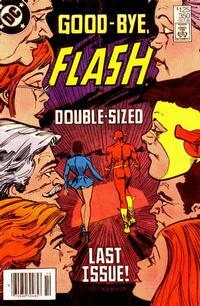 But The Flash of Two Worlds began the core idea of a continuity that would become the cornerstone of DC’s Mythology. I’m of course, talking about “the multiverse”. In Flash #123, Barry accidently vibrates his molecules so fast that he passes into a parallel universe, where he meets Jay Garrick the Golden Age Flash. They have an amazing adventure and it’s established that everything that has ever happened in the “Golden Age Flash” was transposed to comic book form and existed to inspire Barry Allen, his Silver Age counterpart. Thus in a very weird way, if there was never any Jay Garrick, we would have never had Showcase #4, “the comic” that acts as herald for the most iconic age in comics publication history. From Flash #123 on everything from the Golden Age was considered part of Earth-2 and the “current” timeline was part of Earth-1. This simple precedent would carry over for nearly 50 years. A few years later the Flash would pass into another parallel world called Earth Prime that was meant to be a representation of “our” universe where he would meet the creators of the Flash. These two landmark ideas created something that DC had been poorly lacking up to this point: a strong sense of continuity and purpose. This allowed fans of certain eras to enjoy stories without feeling like their heroes were becoming defunct or at the very least: replaced. Instead, “their” heroes would always have a place where they were the star of their own show. Additionally, this also allowed DC to start playing with the concept of “what ifs” and “how comes”. If we wanted a universe where the Spirit of America (Uncle Sam) assembled a group of warriors to fight the never-ending war against the Nazis, we could (in fact they did, this was called Earth-X). Years later, DC would create an entire imprint brand based on the idea of taking beloved characters and putting them in new situations that would radically change them, naming them Elseworlds*. For instance, what if Superman landed in the Soviet Union instead of America? Well because of the “multiverse” – in some corner of creation – it did! This gave DC a marked leg up in the hypothetical market because they could literally do any story they wanted and have it still be considered canonical by simply stating “that’s on Earth (Insert Name Here).” This became so infused into the comics community that years later Alan Moore would declare that the Marvel Universe was technically an ‘earth’ as well – specifically Earth 616, forever and subtly branding the Marvel Universe as a subsidiary of the DC multiverse. All thanks to the Flash and the fantastic writer Gardner Fox! *For full disclosure, the publication of the Elseworlds books would occur after the consolidation of the multiverse – so we must simply infer that the tales came before the multiversity consolidation or after the multiverse was “reborn”. Now let’s jump ahead to the very end of the Barry Allen run of the Flash, where he is convicted of the murder of Professor Zoom, the Reverse Flash. Barry had been pushed to the edge of his rope. And once convicted of this crime, it was revealed to him that someone had been controlling the minds of the jurors from the 30th century. From this point Barry flings himself into the far realms of the future to find not only the mastermind of this plot, but also that the love of his life- Iris West had survived. In a heated reunion they end this volume of the Flash with Barry living happily ever after with Iris in the future…for a time. This is all significant because it gives us a glimpse into something else that is very prevalent in the Flash and the DC Universe proper. Time Travel. While Barry had bounced around time once or twice in his normal run, the end of his book took him to the far reaches of the future where he could have a life and show that the world continued to spin and life for mankind eventually took a turn for the better. This point of view was usually not shown other than in the Legion of Superheroes as DC’s stance was always that of Yoda: “Always in motion is the future”. So for Barry to end up in the 30th century and given a definitive “happily ever after…for a while” was akin to saying that no matter what happens in today’s stories…we survive. This in retrospect was an incredibly bold move that always gave the reader hope that the future WILL be better. In a bitter twist of irony though, this would be the last time we’d see Barry happy for a long time. The next time we see the Flash – we are in the Crisis on Infinite Earths, where a being called the Anti-Monitor was building a machine that would help him collapse reality where he could reshape it in his image. Barry, being one of the only people who could jump from dimension to dimension presented a threat to the Anti-Monitor’s plans and was pulled out of the future and back to the (then) present. Here he was terrorized by the Anti-Monitor and find’s out that he is developing a weapon that will destroy the Earth. At this point, Barry does something that Superman has never done, Batman has never done – in fact most heroes ever created have never truly attempted; Barry chose sacrifice his future to ensure that everyone survives. Certainly it can be argued that each hero risks their lives each time they put on the costume and certainly many have died and been resurrected. But those circumstances usually saved a city (Superman) or at the very best a planet (Green Lantern). This time had a major difference though because Earth-1 presented the Anti-Monitor with the most tangible threat in all of creation. It’s heroes could potentially stop him given the proper amount of time. Therefore by destroying Earth-1 he could destroy the best chance of resistance any dimension could muster. Barry knew this. Barry understood this. Barry knew that not only was he running for his family and friends, he was running for every last person who ever existed, ever would exist or ever could exist. And because of this, Barry did what he did best: he put others in front of him and began to run around the giant weapon, creating a vortex that would draw in all of the cannon’s energy. But in doing so the energy would prove to be too much for his body to take and he began to decay, his entire person becoming infused with this burst of energy that would not only destroy the cannon but the surrounding area almost ensuring Barry’s demise one way or the other. He continued to run though. He ran through space, he began to run through time, and he began to literally run through his own life – flashing before his very eyes before he ran himself to dust. The last vestige of his power was converted to energy and thrown back in time to strike a young Barry Allen working in a police lab to create the Flash. A “perfect circle”, so to speak. With this the Flash became our most cherished icon. Looking back on his run, we see that what made Barry so popular was his humanity and what made him a legend is what makes any hero great – self-sacrifice for the greater good. We see that in everyone around us. For firemen who risk their lives for perfect strangers and for police who try to keep us safe – these people encapsulate the best quality of man: our ability to make a difference for somebody else and to make a connection. Through the Flash we see a character that makes us want to be better and want to try harder. At this point- I could try and point out all the other neat plot points that happened after Barry died and how the Flash has the coolest set of superpowers, but that’s not what this is about. Not really. This is about why “The Flash” Is the Most Important Character of the DC Universe. Not Barry Allen, Not Jay Garrick, Not Wally West or Bart Allen – but the icon – the Flash. He’s our hope. He’s what we want to see in ourselves. Time and time again, that name and costume brings out the best in humanity and in comic fiction. We always talk about the Trinity of the DCU, how Superman is the Legend, Batman the Myth, and Wonder Woman as the heart of the DC Universe; I would posit that the Flash would be DC’s soul, the very thing that makes this mythology so unique. This is what marks the Flash as a character that stands alone from the likes of Superman, Batman or even Wonder Woman. This Trinity of Heroes has on multiple occasions been likened to gods. Superman, a being that is practically a god himself has a disconnect with humanity. While he embodies the perfection of form that we all strive to achieve and the morals to never abuse these gifts he’s been given, he has never been truly challenged to sacrifice everything in a way that would permanently change him. Even when he fought Doomsday, we all knew this would be a temporary death and to DC’s credit, they only kept him dead for about a year. Batman could conceivably come up with a way to change the world if he spend his fortune in purely altruistic ways – building a brighter tomorrow by changing the problems at their core, but he is so wrapped up in his own psychosis (yeah – I said it) that it becomes hard to see him give up everything, including the cowl unless he could be certain that the it would permanently solve said problem. Wonder Woman is the closest in heart and mind to the Flash and the ideals of change, but again – considering she is someone akin to a god, she has never been able to make any real changes in the world she so desperately wants to make right. 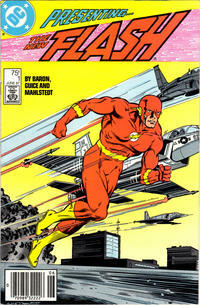 The Flash began as a narrative touchstone, a character whose very stories shaped the entirety of a publishing empire and ultimately has always been the herald of great change in comic books: Golden Age, Silver Age, Multiverse, Death of the Multiverse, Rebirth of the Multiverse and at least 2 separate reboots of DC. 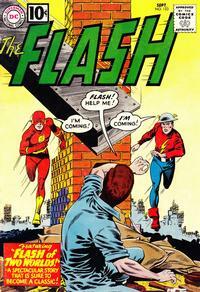 Each time a major change happens in the DCU, we can always look to see the Flash standing there heralding the way. 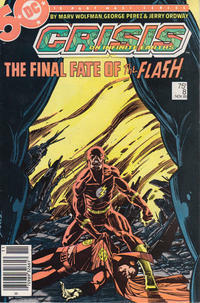 Just think about it – Crisis on Infinite Earths – the Flash was there sacrificing himself so that the cosmos may live. In Infinite Crisis – multiple Flashes were there to help stop Superboy Prime from destroying creation. In Final Crisis – the Flash was there to try and stop a time travelling bullet from triggering Armageddon (Ok that one is weird I admit, blame Grant Morrison). And finally with Flashpoint we see that because of one act, one change in the past, the entire DC Universe is about to be “irrevocably rebooted”. Not with thunder, not with lighting, but with a Flash. And thus he is the Most Important Character of the DC Universe. Covers via comics.org. Shaun Rosado can be found at the Shauncastic! podcast. This entry was posted in Flash History, Opinion and tagged Barry Allen, Final Crisis, Flashpoint, Golden Age, Guest Posts, Infinite Crisis, Jay Garrick, Multiverse, New 52, Reboots, Silver Age, Wally West on August 30, 2011 by Guest Blogger. Extremely well written, and in-depth! You make a great argument, that really can’t be refuted. Great job!! Thanks for the well put-together editorial, Shaun. I sincerely hope that this relaunch of Flash kicks us into another “boom period” for the Fastest Man Alive. Great piece, several points I had not really considered about the Flash. Most of DC continuity for the past 50 years is built around the parallel worlds idea that Flash helped usher into comics. Even Marvel ripped it off to some degree. 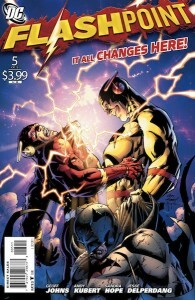 I think Flashpoint is an appropriate and fitting culmination to the idea that the Flash is central to the DC universe. The greatest manifestation of the Flash as a symbol of hope for me was Wally West conquering all odds to become the man everybody doubted he could be. What made it resonate so well was that he had to try, and fail, and try, and fail, and never give up to succeed. It was the failure that made the hope necessary. Another equally important side to the Flash as an icon. This was really fascinating, I am already a Flash fan and this just made him even more amazing! I love that he’s so central to the DCU (I guess that’s why they work in Central City, sorry lame joke…) anyway great work! He really is the keystone to the DCU.